In September, a group of fish biologists, engineers, and farmers met at Reclamation’s Denver Technical Service to help ensure that the San Joaquin River Restoration Program’s largest engineering feat to date – developing a new stretch of river with passage for salmonids and other native fish – will pass environmental and engineering muster. And they accomplished this, in part, by building a model. In this case, the effort involved building a 1:12 scale model of the Compact Bypass Control Structure and studying the operation of the designed fish ladder and structure control gates during multiple flow scenarios. Fish passage for juveniles, which out-migrate downstream and to the ocean, was simulated using floating beads to study the impacts of different flow scenarios to fish passage through the control structure. The Compact Bypass Control Structure, as envisioned, will direct San Joaquin River flows into a newly created, mile-long bypass channel around Mendota Pool. A secondary control structure will maintain water levels in Mendota Pool so as to not impact agricultural diversions. When complete, the two control structures and the bypass channel, located in Reach 2B of the Restoration Area, will provide volitional fish passage for salmonids and other native fish traveling up and down the river during their life cycle while maintaining the ability to divert San Joaquin River water for agricultural needs. Even in the advent of the computer age, physical models can still provide hydraulic data that can’t be achieved through computer simulations. 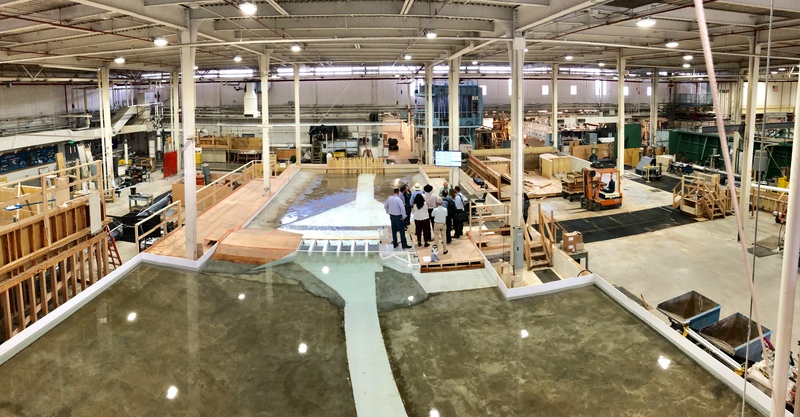 Physical models have been used for decades by the Bureau of Reclamation, including massive undertakings like Glenn Canyon Dam, to test the real-time effectiveness of water projects. These models are important with helping engineers and biologists identify and refine project design prior to construction – avoiding potentially costly design flaws.